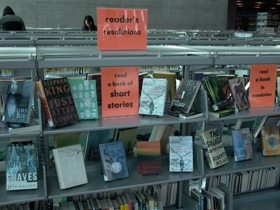 Reader’s Resolutions | Lindsay, reading. Do you think it’s time for another list? I’d love to see another list! Anything that gets me reading more and reading outside my usual genres. I’ve used this as a guide, but added a few of my own that I’m trying to tackle too: read a series (e.g. George R.R. Martin), read a book that scares you (like War and Peace for me), read a book by an author from each continent… the options are limitless!